As an acclaimed Principal Dancer at New York City Ballet her eloquent line, impeccable technique, and soaring stage presence made her a star in the Balanchine repertory as well as a muse to Jerome Robbins. Now an internationally renowned teacher and repetiteur for The Balanchine Trust and The Robbins Rights Trust, she is seen here coaching Aria Alekzander of Houston Ballet. 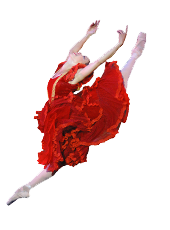 Ms. Calegari currently co-directs the Caleco Ballet Studio in North Salem, NY. Photo of Maria Calegari and Aria Alekzander by Amitava Sarkar. Photo of Maria Calegari courtesy of Steven Caras, 2010. Maria Calegari in Mozartiana, choreography by George Balanchine. Balanchine® is a Trademark of The George Balanchine Trust.